I am an anti pet person. Why? Well a variety of reasons. Firstly, I get very attached to things and when it comes to a pet being ill, I am not sure that I wouldn't spend our life savings keeping our hamster alive, for it to die a few days later. I am not good at picking animals up. You may remember my terror at holding a lamb earlier this year. Animals have legs and can move and I have a fear of them running away from me and getting lost. Also animals can't go on holiday with you. I like the idea of being able to go away and not having to find someone to come over and feed my pet rabbit. However, in May, I started to warm up to the idea a little. 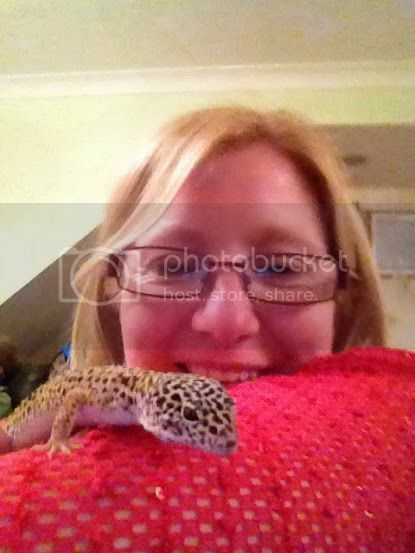 When Suzanne from 3 children and it was looking for her gecko to have a home for a week, I jumped at the chance. I knew big man would love him. FYI if you are leaving your pet gecko with someone who is a bit anti animals there are a few things you shouldn't say. For example, telling them that his tail may fall off if you frighten him may scare the life out of them. Stories of crickets escaping are again not that great. Saying, if he dies, don't worry, just makes you worry that you may kill him. Maybe, just maybe the "I'm never having pets lady" is slowly starting to change her mind. Do you love pets or share my fears? Please tell me I am not alone. Oh my goodness, you are just the same as me! We're not 'pet people' at all, but the boys really want pets and I've just started thinking I'm being a bit mean to not let them have them. We are going to get guinea pigs! I'm actually excited about the idea now and so is my animal hating daughter. I think it will be good for all of them. Impressed that you would volunteer to look after Reggie when you're not an animal lover. And well done to you for keeping his tail on! I love pets, but the whole dying thing is just too much. We always had dogs when I was growing up and was fine with the whole thing, but now I have kids, I'm a wuss and can't face it. Well done on looking after Reggie, did his tail fall off.. and does it grow back? Yo like like you are positively enjoying it there! Thankfully it didn't and yes they do! Couldn't imagine a life without pets to be honest. It seems most odd at times when we haven't had them. We love our cat Stevie, but he is an expensive little blyter! He is worth it though - every home should have some sort of pet. Start small wish a gold fish?